This page will introduce a solution for Windows Server 2003 partition resizing so that you don’t need to compress drive to save disk space. Download IM-Magic Partition Resizer Server to reallocate disk space to the partition that is on low disk space on Windows Server 2003. Nowadays, hard drives can have an amazing amount of space, but the size of files is also lager and lager. And, the result is that you still cannot escape from the problem of low disk space on hard disk partition when more and more data is stored on it. Therefore, a solution to resize the hard disk and reallocate more disk space to the partition that runs on low disk space is often quite important for many computer users. As a matter of fact, you can rely on professional partition software IM-Magic Partition Resizer Server to resize the hard disk on all Windows Servers. Download, install and run IM-Magic Partition Resizer Server. Right click a partition that has free space and choose "Resize/Move" option. Move the arrows to shrink the selected partition and then you can see some unallocated space. You need to move the unallocated space close to the partition that is lacking of free space. Then, right click the partition and choose "Resize/Move" option. Move the arrows to extend the partition and then click "Apply" button. "C drive is running on low disk space on Windows Server 2003. 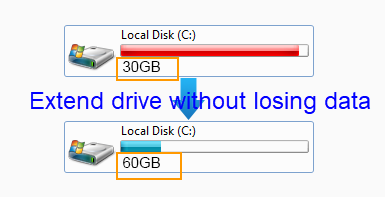 I allocated 40GB space to C drive when building the hard drive on my PC, but recently system begins to pop up low disk space alert message to ask me to delete some files to free up space on C drive. I want to know if there is any solution for Windows Server 2003 C drive expanding without deleting any file." Although you can build a hard drive that has a amount of capacity on your Windows Server 2003 PC, the disk space will run out someday since different kinds of data is written to the disk partition. When there is no enough free space on a partition, you may receive low disk space warning message on Server. Whether you know it or not, there is a "Compress drive to save disk space" option on the Properties of local disk drive. This option allows you to compress drive so that you can save some disk space on the selected drive. However, it will have a terrible influence on the performance of your PC if you compress the C drive. Besides, it is time-consuming because you need to decompress the drive in order to use the files. You can also compress one or more folders on a drive to save disk space, but anyway it doesn't have much help to resolve the low disk space problem. When a partition is running out of disk space on Windows Server 2003, a common solution is to extend the disk partition with help of third-party partition software. You can move free space from other partitions to extend the low disk space partition, so that you don't need to compress the drive or compress folders on the drive. 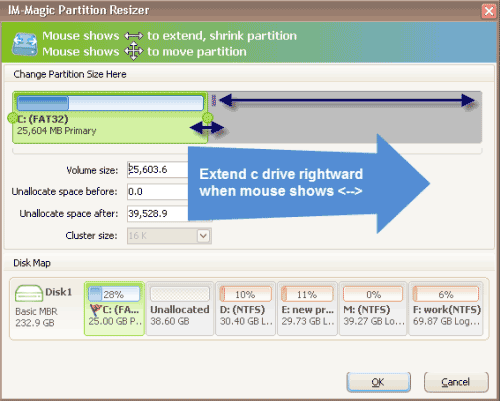 IM-Magic Partition Resizer Server enables you to resize hard disk without touching any data stored on the disk. Without touching data on the disk or compressing the drive, IM-Magic Partition Resizer Server provides a safe way to perform hard disk resizing without any influence on the performance of PC or hard disk. Usually, nothing can be more frustrating when system partition is running out of disk space. If it is a data partition that runs on low disk space, problem can be resolved easily be moving files from one partition to another. However, data stored on system partition is often important and cannot be moved. So nothing can be better than extending the system partition with third-party partition software. IM-Magic Partition Resizer Server allows you to extend system partition on Windows Server 2003, SBS 2003 and Windows 2003 R2 and other Windows Servers. This partition software can also work on Windows 2003 VMware and RAID 5 disk to fix low disk space problem on system partition. With this software, you can resize NTFS and FAT32 partition without rebooting the computer.